In my spare time, I shop. Mostly online shopping during the wee hours of the night. Insomnia shopping is dangerous. Items that I don’t recall purchasing find themselves on my doorstep. Stores that I have visited recently include Anthropologie, West Elm, and Pottery Barn. These stores actually have more things in common than my credit card. They all have items that are featured in my blog this week about branch decor. A companion to my leaf decor blog a couple of week ago, branches are showcasing themselves within the bedroom as a natural and interesting alternative to decorating this fall. In the aftermath of Hurricane Sandy, there was definitely not a shortage of fallen tree limbs. Inspired by mother nature and my shopping addiction, and not to mention Veteran’s Day is today, this week’s blog is a eulogy to all the fallen branches. Towards this end of Anthropologie’s winter catalog, you will find this masculine water pitcher. Its antler like branches mean business. The Surroyal Pitcher is a creative alternative to the plastic water bottle that I tote to bed to alleviate any late night thirst. 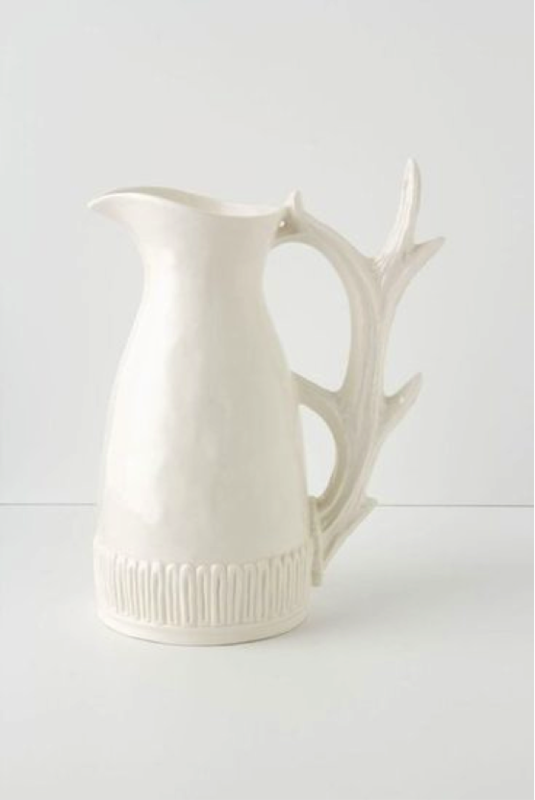 If not used as a pitcher, it could also be used a vase on the nightstand. Branch decor can be in many different widths and thicknesses. Sandy’s aftermath brought down not only limbs, but entire trees. Throughout my neighborhood, tree trunks were being piece-mealed for disposal. What a shame to see such organically beautiful trunks being tossed out as mulch when retailers such as West Elm are selling them for close to $200. Stumps can be used alongside the bed in lieu or in addition to existing nightstands. The latter will give you the extra real estate space you need to set down Anthropolgie’s branch pitcher above. At Pottery Barn Kids, Christmas is in full effect. 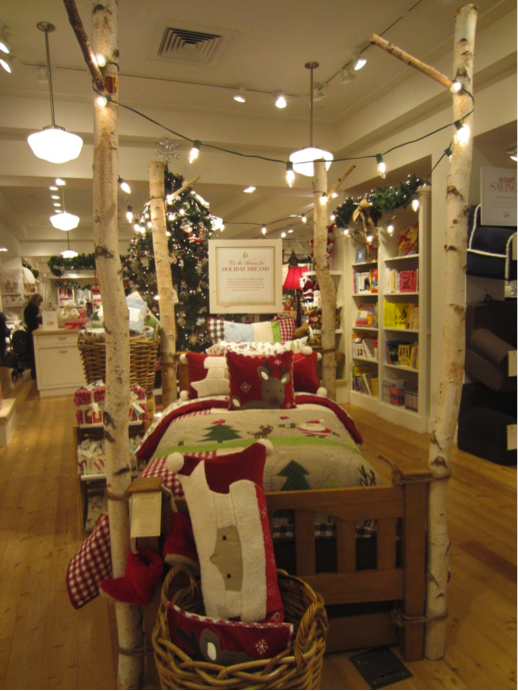 Despite the overwhelming Christmas decor, the four poster tree branch bed was the only thing that kept my attention. Close up, the tree trunk was the perfect selection and texture of gray and white. It was attached to the headboard and footboard of a simple oak bed using nautical rope. Truly inspiring considering similar types of branches are currently being tossed as rubbish. Despite the havoc that Sandy caused, there is still beauty to be seen in it, even in the bedroom. Look and Find Myths and Heroes written my Melanie Zanoza Barteime; illustrated by Douglas Holgate. So you love looking for Waldo but perhaps you have found him already. Or maybe you long to seek something hidden in a crowd but also want to tell yourself it’s “educational”? Well, then, look no further! 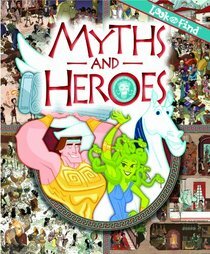 Look and Find Myths and Heroes has it all! Is that Artemis I see, poised with her bow? Look out, Theseus! There’s the Minotaur, right behind you! Now where is that awesome Heracles T-shirt? Okay, so this isn’t high art or cultural studies, in fact despite the subject matter, there is practically no information about any of these personages from ancient Greek culture. And they are not nearly as challenging as the Waldo books; each page looks like one corner of Where’s Waldo? blown up into a two-page spread. But you know what? It’s still pretty busy and it’s still pretty fun. There’s tons of stuff to look for, including protein shakes for Heracles, Apollo’s lyre and souvlaki for, well, all the Greeks! Nevertheless, if you are looking to learn anything about mythology, this book is sadly lacking in even the most basic information. But for a quick little mental challenge before bedtime, it’s definitely worth a look. Happy Day-After-Thanksgiving, dear readers! 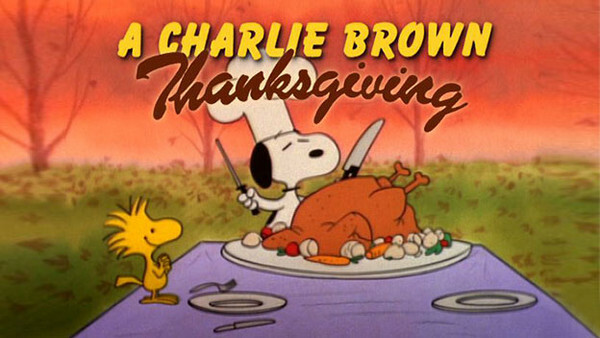 Instead of a normal review, we have brought you a live-blog of the holiday favorite, “A Charlie Brown Thanksgiving.” Enjoy! 0:05 – Okay, here we go. Lucy is questioning Charlie Brown’s masculinity via a game of football. Equating the kicking of the pigskin with the thanks we give as a nation, she clearly understands how insecurity and patriotism go hand in hand. 2:02 – “What did you expect? A turkey card?” Sally Brown delving into surrealism as she ponders the US Mail System. All these kids seem so troubled by holidays. Oh jeez, here comes Linus to ruin everyone’s fun by explaining what Thanksgiving is really about. Blah, blah, blippity bloo. 6:00 – Chuck’s having a meltdown. Now he has a bunch of kids coming over for dinner and he’s going to his Grammy’s house. Of course! Let’s just have two dinners and ask the dog to cook!! 7:10 – Some god awful jazz music is playing whilst Snoopy and Woodstock prep ping-pong tables for the big event. It’s pre-Sandra Lee tablescaping on a budget! “Little Birrrrdy….” Seriously, this song is filler. Snoopy is caught between said ping-pong tables, yet emerges triumphant. Alas, now the Adirondack chair is now assaulting him. That’s life. 10:15 – Rosie and her friends (including that poor girl Marci, who wear glasses yet has no pupils) have taken it upon themselves to decide that this Thanksgiving should be contempo-casual. “You can come as you are,” she proclaims while Kurt Cobain shudders from the heavens. 11:00 – Snoopy is cooking! Toast is toasting. Butter is buttering. Popcorn is popcorning. This is a very carb-heavy Thanksgiving; I suggest some Activia for dessert. Does anyone find it gruesome that a bird is helping to cook this feast? 13:10 – Snoopy and Woodstock are now dressing up as Pilgrims, cause Snoopy, y’know, just had that outfit lying around. What if someone dressed up as Snoopy and then dressed up as a pilgrim as well? Thankful Furrying? Charlie Brown does the right thing and puts that dog in a chef’s hat. 15:35 – Everyone is seated. Outside. In November. I never knew Peanuts took place in Palm Beach. 16:00 – Oh god, Linus is explain Thanksgiving AGAIN. Give it a rest kid. No one likes someone being the moral compass at every party. At least he’s surrounded by what look like raspberry parfaits. 17:20 – Rosie is flipping her lid. Jellybeans? Popcorn? Obviously the woman is open-minded because she seems not to mind a dog serving her. Let it be known, though, never give Rosie O’Donnell a pretzel stick or she’ll ream you. Rude. 17:35 – Shot of Sally eating. She’s useless. 18:25 – It takes a girl without eyes to muster up the courage to put Rosie in her place. There’s a parable there, I think. Now she’s asking Marci to hit on Charlie Brown for her. This cartoon is very unrealistic. 19:10 – Linus is bringing up Myles Standish AGAIN. Stand down, blanket boy! 20:13 – Rosie apologizes and asks not to play, “lovers games.” Again, unrealistic. 21:20 – Chuck’s talking to Grams on the phone and she sounds like she’s chewing on a mouthful of squirrels. She invites everyone to come to her condo for Thanksgiving dinner. Oh, that’s right. Palm Beach. 21:45 – They all leave Snoopy behind so that he and Woodstock can eat a turkey dinner Snoopy’s been hoarding in his doghouse. Again, Woodstock, a little bird, is eating a turkey. This seems very wrong. 22:00 – And it’s all over and what we’re left with are the credits and Snoopy gorging himself on pumpkin pie and guilt. Blame it on Rosie. I recently picked up a small smoked ham from my favorite German butcher. Perfectly sized for a dinner for two, it needed only half an hour in the oven to bring out its delicious smoky flavor. Roasted baby potatoes and pan-fried Italian zucchini completed the evening menu. It was more than 50 years ago that Dr. Seuss (Theodor Seuss Geisel) penned this now ubiquitous verse. Many of us have taught our children to read with the help of Sam-I-am, beloved character in one of the most famous children’s books of all time. What better inspiration was I hoping to find behind my refrigerator door? So I went with it. For the “green”, I used a bunch of fresh baby spinach leaves (I probably would have used the pan-fried zucchini, but we had polished that off the night before). Fortunately, a handful of roasted baby potatoes still remained. Sliced super-thin, tossed with olive oil into a hot pan, and seasoned liberally with salt, pepper and paprika, they were the perfect companion for my green, ubiquitous breakfast in bed. Heat olive oil in small, heavy pan over medium heat. 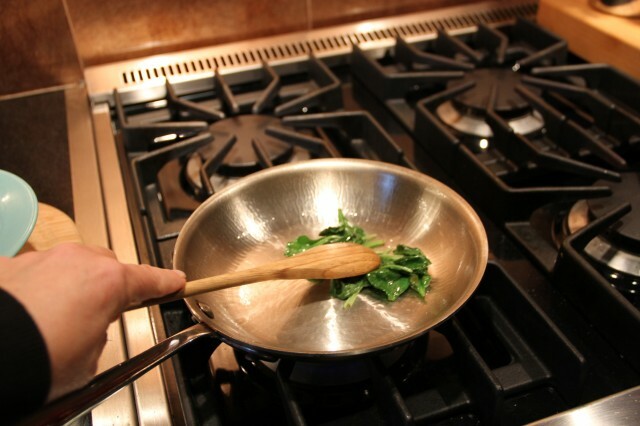 Place baby spinach leaves in pan and cook until wilted, 1 to 2 minutes. Reduce heat to medium low. Break eggs into small bowl and whisk well with milk or cream. 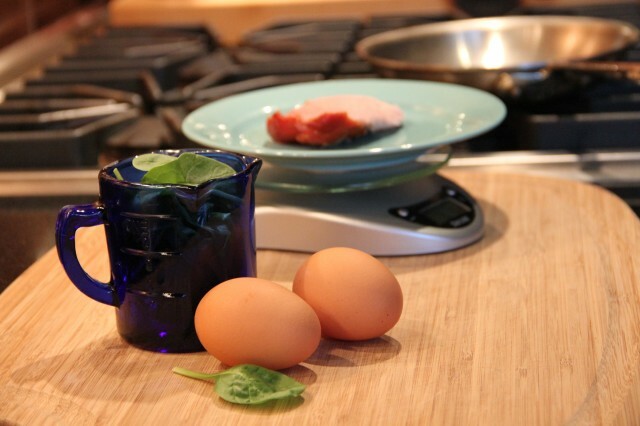 Add eggs to heated pan and allow to cook slowly and gently, folding over around wilted spinach. Stir and lift frequently with wooden spoon to avoid sticking. 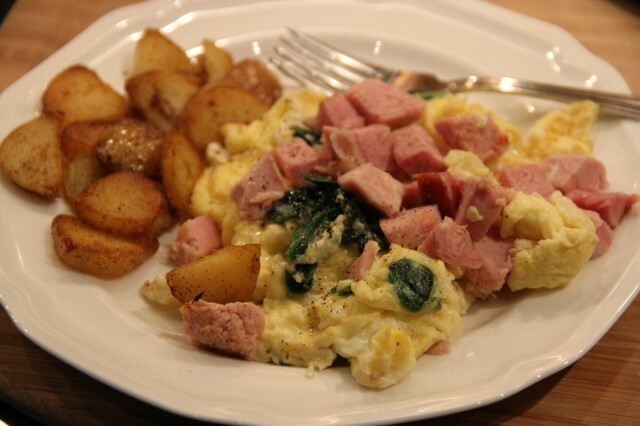 Toward the end of cooking, add cubed ham to the top of the eggs, just to heat through. 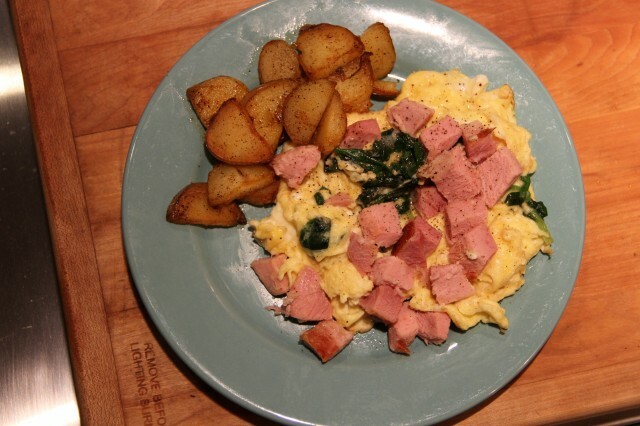 Slide green eggs and ham out onto plate. Serve immediately. Add a side of home fries, if you like. Many years ago when I was an art student I took a course in the Art and Culture of Western Africa. My professor was a lovely man and a consummate storyteller. One of the tales he shared with us was about the Yoruba people of Nigeria. The Yoruba have the highest rate of twin births in the world. Twins are revered in their culture and seen to be fortunate. They are given special names and the entire community rejoices at their birth. The story that stuck with me the most is that for Yoruba people, the first twin born is actually considered to be the younger twin. This twin enters the world and checks things out, letting the older, more dominant twin know that it’s safe to be born. Throughout the years, amongst twins I’ve known, I’ve seen this pattern repeated time and time again. The firstborn twin is the twin that is more extroverted and active, while the second born twin carries a quiet wisdom and confidence. What does this have to do with bedroom design? Twin beds show up frequently in good design. Just like with their human counterparts, twin beds add something special to a room. Twin beds give a room symmetry and balance. They are both a bold and an innocent choice, reminding us of our youth and the good fortune of having enough room for everyone. Twin beds are not just for children; they are often enjoyed in vacation homes and guest rooms- joyous spaces that are meant to be shared with others. 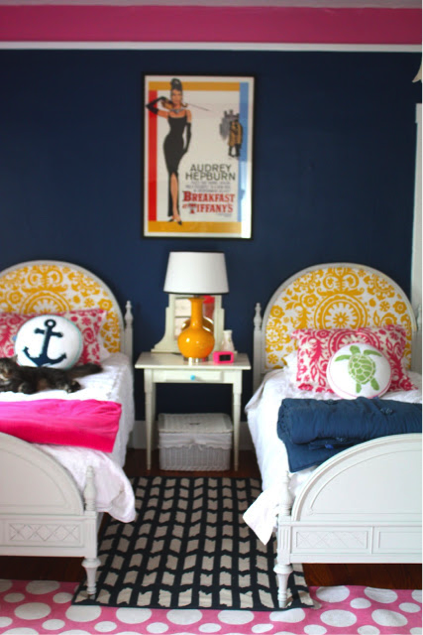 The graphic prints of the headboard and the two rugs really attract me to this room. If you head over to the blog, it shows the transformation of these beds from yard sale find to what you see above. Really cool DIY idea. 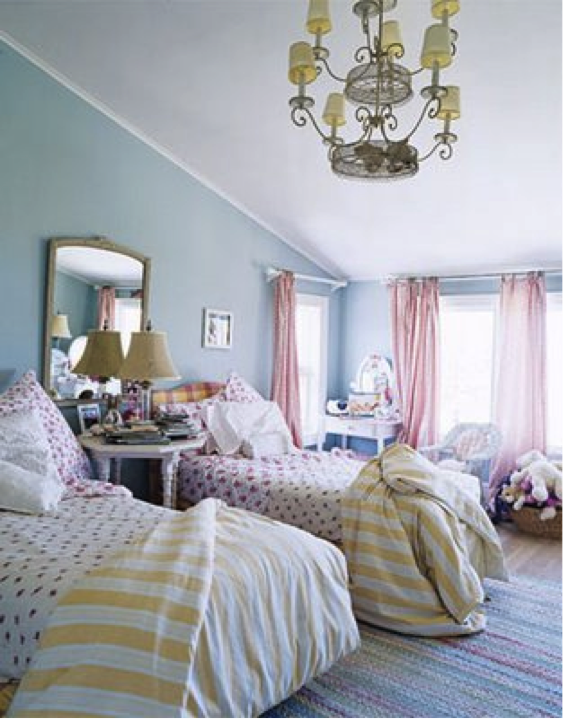 The sweet sophistication of this room makes me want to curl up in one of these beds and sleep for a really long time. Clearly, the room pictured is for a child, but what I find compelling is that the room also has real “adult” furniture and accessories that make it versatile. Anyone could sleep comfortably here. Turquoise! Tufted velvet! 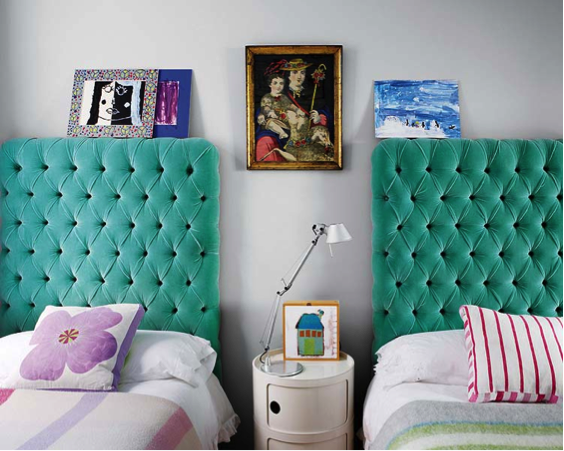 These unique twin headboards could be dressed up with different linens for adults, but are totally kid appropriate too. May twin beds bring good fortune to your home.